Almost every production of Shakespeare you are likely to encounter includes cuts to the text, and there’s good evidence that this has always been the case, even back to the performances at the Globe and the Theatre before it. After all, one of the perks of having the author in the company is that the script can evolve based on what’s working with a particular cast at a particular time, and since Shakespeare certainly never signed off on any sort of official author’s edition of his plays, we’ll never know if he had a definitive version in mind of any play in the first place. Thus we have a long history of rewriting, rearranging, and re-editing the plays to suit our own purposes in our own times for each production. Robert Richmond's production of Antony and Cleopatra, currently playing at the Folger Theatre, is no exception. The politics and characters are pared down extensively to keep the focus on the doomed lovers, with captivating results. Tony Cisek’s transformation of the Folger into a theatre in the round, and Andrew Griffin’s sumptuous lighting design lead the eye inevitably towards the lovers at center. 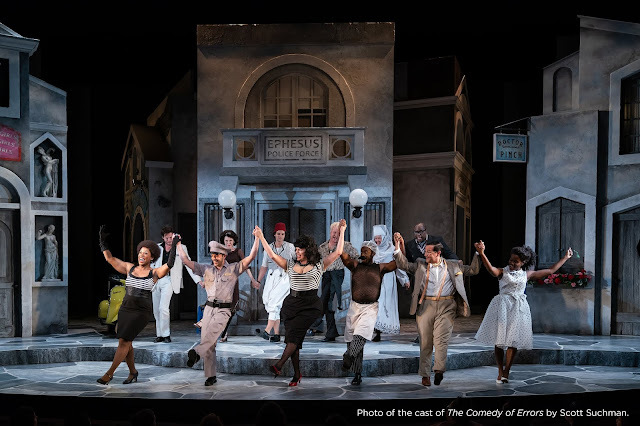 With Shirine Babb’s Cleopatra and Cody Nickell’s Antony at the helm, our experience of Shakespeare’s tragedy becomes one centered on their love story. With Richmond's cuts and with this cast, Antony and Cleopatra is the story of two leaders, each entirely used to getting their own way. They charge ahead through the force of their own personality, handily supported by the political power that means their every whim must be obeyed. Cleopatra rules Egypt as she sees fit, and Antony can hardly be bothered to check back in with the rest of his triumvirate in Rome. More personally, it becomes apparent all to quickly that as a romantic partner, neither has ever had to actually consider another person’s needs in a relationship, much less prioritize those needs over their own. Babb and Nickell show us two grown adults, grappling with basic issues of how to be a human being relating to other people and making mistake after mistake- but somehow, learning to instinctually return to a bedrock of passion and genuine affection after every trial. They should have learned better long ago, but then, their paths might never have aligned had they lost their singular focus. The unchecked impulses of both Antony and Cleopatra ultimately lead to their deaths, giving us a story of two lovers, that is equally grandiose and foolish, both possessing unimaginable power that fades instantly into utter mundanity in death. We remember their story, of course, and have seen many a staging of their Alexandrine revels, but Richardson paints us a picture with few illusions. Babb in particular is excellent at showing Cleopatra in the moment of realizing that she may have hurt Antony for no reason other than a moment's passing whim, and you can see etched on her face that all too familiar, all too human expression of someone humbled by their own mistake. Shakespeare's tragedy isn't lessened when we take the time to notice how flawed, and how human, every legend once was.